CBC Vancouver is proud to be part of our community and a supporter of local music! We are bringing Musical Nooners back for our 9th year. 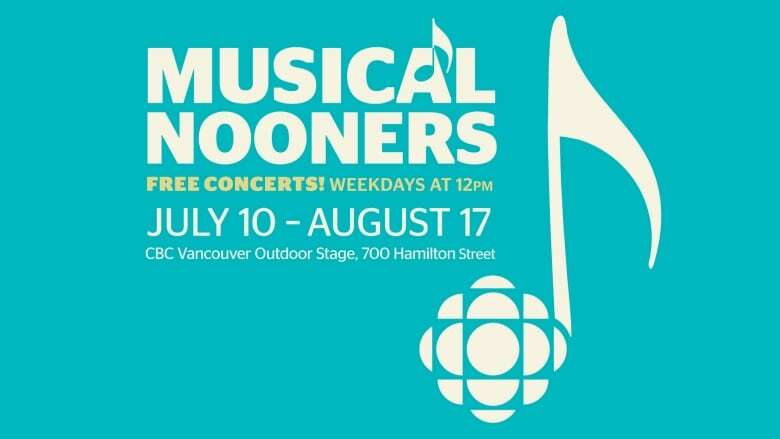 All summer long, join us weekdays from 12-1 p.m. for free live concerts on our CBC Vancouver Outdoor Stage and Plaza located at 700 Hamilton Street. While our Senior Meteorologist, Johanna Wagstaffe has assured us she is doing everything she can for amazing weather during the series, be sure to follow @CBCVancouver and #musicalnooners for any updates and schedule changes due to inclement weather. The rap duo Mob Bounce is ready to show you their fusion of culture, EDM and hip hop as they kick off the Musical Nooners. Their powerful lyrics and electric music will certainly make you bounce with the mob. Hailing from Mexico, Son de Madera creates a unique musical and cultural experience that you don't want to miss. Featuring lyrical string-driven music and powerful vocals, this son jarocho band will surely have you dancing! Few people dedicate their life to keep an art alive. Jimmy "Duck" Holmes is the last living practitioner of Bentonia blues and the owner of the oldest juke point in Mississippi. His music will tug at your heartstrings. Holmes will be joined by Robert Connely Farr and Mike Munson. The multi-talented Little Miss Higgins brings her powerhouse vocals and poetic songs to the series for a rocking hour of old-time country blues. Rooted in Canadiana, Little Miss Higgins' music is catchy, fun, and passionate. This husband and wife duo shares their love with listeners through their music. Fall in love with Winsome Kind as they serenade you with their sweet melodies, flawless harmonies and honest lyrics. Jack Garton is a multi-instrumentalist and performer backed by the talented Demon Squadron band. His shows take you on a rollercoaster ride of genres and catchy songs that features the guitar, brass instruments, and even the accordion! Emerging from her YouTube fame as a pop musician, Haley Blais keeps it real with her soulful voice. In her forthcoming EP, Blais is backed up by a full band for the first time. The 23-year-old has dazzled over 165,000 YouTube subscribers and will captivate you as well! An award-winning performer and seasoned vocalist, Dawn Pemberton's voice is a force to be reckoned with. Whether she's performing funk, soul, jazz or gospel, your body will be grooving along to the music of Vancouver's soul queen long after the concert is over! The Latin band, Rumba Calzada brings an eclectic mix of salsa, jazz, and Afro-Cuban rhythms. Led by Raphael Geronimo, this Juno-nominated band's joyous and powerful music will make your day! Adam Robert Thomas is a Vancouver based, JUNO-nominated bassist, singer and composer. His first solo self-titled album recently stood out at #11 on the R&B charts in the U.S. Get ready to be amazed by his soulful voice at the CBC Vancouver Outdoor Stage! After the release of the debut album "Guard Your Heart" in 2017, Portraits of Us have graced venues with their charming melodies and intricate vocals. You'll definitely find yourself singing along with the beautifully written tunes from this husband and wife duo. Started as a brother-sister duo, Fallbrigade brings the "adventurous and eclectic upbringing" in their music. They made it to the top 10 of this year's CBC Music's Searchlight competition. Currently, the five member band connects with the listeners through soulful writing and stringed instruments. The 2017 winners of CBC Music's Searchlight competition just released their first album "Landscapes". Be sure to come and listen to The Long War take you on a musical road trip with their rich lyrics, melodies and harmonies while redefining modern Canadian folk-indie-rock. Swing along the "spontaneous swinging jazz music" of Jen Hodge. With expertise in traditional jazz, she has travelled across the world but finds her peace in Vancouver's Gastown. Get ready to move and groove on her melodious tunes. Old Soul Rebel brings stories from their past to life through their honest lyrics and powerful vocals. Experience soul and rock n' roll music like never before with Old Soul Rebel's unique twist. The incredible talent of Sinclair & Bennett live on the CBC Vancouver Outdoor Stage will instantly captivate you! Comprised of the seasoned performers David Sinclair and Keith Bennett, the blend of Sinclair's percussive guitar and Bennett's harmonica talents brings songs to life in a way that cannot be missed. Relive your childhood days as Will Stroet performs on our stage. The Juno award winner has performed at more than 1500 shows and is famous for his TV series, "Will's Jams," which airs weekday mornings on CBC Kids. Known as Vancouver's traditional bluegrass standard-bearers, Lonesome Town Painters bring high energy and passion to their performances. With their talented playing and spirited vocals, Lonesome Town Painters will have you dancing all throughout the hour! If you like fusion, then you will love this Afro-Latin band! Tanga is a collective of young west coast musicians that bring Latin funk, jazz, hip hop, salsa, electro beats, and Afro-Cuban together. This diverse group will make you dance beyond borders. Have a taste of country, folk and rockabilly music with a hint of rhymes from the past. Petunia & The Vipers are considered to be one of Canada's best indie bands. Get ready to be thrilled by their cutting edge creativity. David Ward recently burst back onto the independent music scene with a monthly song reveal from his upcoming release "Violet, Gold + Rose" His soulful voice mixed with dreamy instrumentation will keep you moving and grooving all throughout the summer concert. Since the 1970s, Roy Forbes has followed his passion for creating music packed with energy and heart. This Canadian folk icon will bring his audience pleasing show to the Musical Nooners stage for a very special performance. With their smooth voices and infectious beats, these young artists are climbing their way to the top with their heartfelt music. Schwey's music effortless groove that brings together a wide range of styles, creating something that is uniquely their own. Winner of CBC Music's Searchlight contest in 2016, this, ukulele playing singer-songwriter has become one of the best undiscovered voices in Canada. Desirée Dawson considers music to be therapeutic and an effective healer. Her track "Wild Heart" will certainly make your heart melt! Caleb Hart's high energy performances have brought him around the world to share his music. His Trinidad and Tobago roots come through in his catchy tunes and powerful voice, which makes up his own "Island Soul" music. Led by Sherri-Anne, Sister Speak is known for its uplifting and moving performances. After performing around the U.S. and Canada, the artist now brings her soul with thought-provoking lyrics and guitar strings on our stage. Rock on with Wooden Horsemen as they take you for an electric musical performance! Inspired by the story of the Trojan Horse, Wooden Horsemen bring together a variety of genres, rooted in folk and blues while thinking outside of the box. Regional finalists in CBC Music's Searchlight competition in 2016, Coco Jafro have many other awards under their name. They bring together the schools of funk, soul, jazz, and Afrobeat. This unique mashup will refresh you up at our Nooners concert series.